Alex Iwobi’s successful penalty in sudden-death saw Arsenal come away with a win in the International Champions Cup on Wednesday. 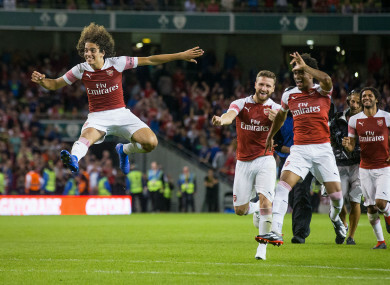 Matteo Guendouzi, Shkordan Mustafi and Reiss Nelson celebrate. THE DAWNING OF new eras at Chelsea and Arsenal continued apace in Dublin on Wednesday evening, as the Gunners prevailed 6-5 on penalties following a finely-balanced 1-1 draw made possible thanks to a 90th minute equaliser from Alexandre Lacazette to cancel out Antonio Rüdiger’s early header. Ruben Loftus-Cheek missed in sudden-death following 10 expert efforts one after another, with Alex Iwobi scoring the decisive spot-kick to earn the win for Unai Emery’s men as Maurizio Sarri suffered his first defeat as Chelsea boss ahead of Sunday’s Community Shield clash with Manchester City. Over 46,000 supporters packed the Aviva Stadium for the encounter, as both sides wrapped up their respective International Champions Cup campaigns with another high-profile friendly which offered a chance for both new bosses to tinker and test their squads and tactical setups ahead of a tricky Premier League campaign which holds high demands for both men. Replacing Antonio Conte and Arsene Wenger will prove a mighty task for both Sarri and Unai Emery, with the challenge of re-uniting their new employers with Champions League football a bare minimum heading into a new era at Stamford Bridge and the Emirates alike, following dreary, disappointing fifth and sixth place finishes last season. Former Gunner Cesc Fabregas received a chorus of loud boos and hollers from the Lansdowne Road faithful wearing red shirts ahead of kick-off in Dublin, but it was the Spanish midfielder who had his mark all over Chelsea’s opening goal. Promising 17-year-old winger Callum Hudson-Odoi looked a constant, menacing threat cutting inside on the right wing. A cross from the teenager — who was instrumental in England’s U17 World Cup success back in October 2017 — set Fabregas up for a powerful strike which demanded an athletic and impressive fingertip save from ex-Blues favourite Petr Cech between the sticks. Fabregas lobbed in the resulting corner, with Rüdiger peeling away from his marker to send a pinpoint headed effort waltzing low into the bottom corner to make it 1-0. A relentless opening period showed no signs of letting up as Chelsea earned a penalty just 10 minutes after taking the lead. Hector Bellerin saw himself penalised by Donegal referee Paul McLaughlin for a late challenge on winger Hudson-Odoi, with the defender giving Chelsea the opportunity to double their lead and potentially put the game to bed before it had even got going. Alvaro Morata stood over the spot-kick, but a poorly stuck effort combined with a fine Petr Cech diving save saw the goalkeeper parry the shot away for a corner to the raucous cheers and applause of the Gunners supporters inside the Aviva Stadium. The early penalty save initially looked like the sort of moment which would propel Arsenal onto a first-half equaliser to level proceedings. Despite a plethora of chances reigning down on their opposition’s goal courtesy of a star-studded frontline featuring Henrikh Mkhitaryan, Pierre-Emerick Aubameyang and Mesut Özil, nothing would yield for Emery’s men. Morata, too, had a number of excellent chances come his way. But looking slightly off the pace and showing signs of that devoid of confidence which was his undoing throughout much of last season, the forward failed to convert time after time. Indeed, Hudson-Odoi looked like Sarri’s side’s most potent attacking threat throughout the friendly and when Fabregas played the young forward clean through on goal it looked certain to be to double their side’s advantage as he beared down on goal in a one on one situation. A quick closing down of space from Cech took the initial sting away from the forward’s curled finish, before a dramatic goal-line clearance from the head of Shkodran Mustafi brought an end to the danger. Another flurry of chances at both ends zipped by in a flash after half-time, the nearest of which saw Aubameyang a whisker away from sliding in the equaliser. But Mustafi’s goal-line clearance proved to be the game’s most high-profile moment of drama as the dull passage of a friendly took command for the final stages. The introduction of Alexandre Lacazette reignited the game’s flare in the dying minutes as the stiker looked to get on the ball immediately and make life difficult for Davide Zappacosta and Ethan Ampadu off the bench. The French striker curled a brilliant effort a matter of inches wide of the post, minutes before substitute goalkeeper Marcin Bulka produced a sublime low save to deny Iwobi a dramatic late equaliser which Arsenal’s deluge of chances suggest would eventually come. It looked like never coming, until it did with the very last kick of the game. Second-half introduction Reiss Nelson did well to latch onto an Özil through ball just inside the box, before crossing dangerously into the middle of the area. Lacazette always looked like the player to make something happen in the final few minutes after his entrance off the bench and it seemed fitting that it was the French striker who poked the ball beyond Polish goalkeeper Bulka to send the game to penalties in stoppage time. Spot-kicks saw ten fine finishes follow one after the other, before Loftus-Cheek’s poor strike in sudden-death gave Iwobi the chance to earn the win — an opportunity which the Nigeria international didn’t pass up, cooly slotting the ball past Bulka. Email “Gunners prevail on penalties as Arsenal and Chelsea entertain 46,000 fans in Dublin”. Feedback on “Gunners prevail on penalties as Arsenal and Chelsea entertain 46,000 fans in Dublin”.